And it's not because other people might find it annoying. Taking pictures of your food before you eat it is like a millennial ritual. It has to happen, even if your food is getting cold in the meantime—how else will everyone know exactly how delightful your brunch was? What's even the point in brunch if you can't Instagram it?! Well, according to new research, there are more reasons other than cold food and annoying our fellow diners to stop this habit asap. The Independent reports on a new paper which links over-exposure to food (through looking at or spending time Instagramming it) with pre-satiation, i.e. you're bored of the food before you even start eating it. The paper's co-author, Professor Joseph Redden, told The Independent, "When we Instagram, we inherently must focus our attention on the item in the picture, even for that very brief moment. This can have a range of effects on later enjoyment." 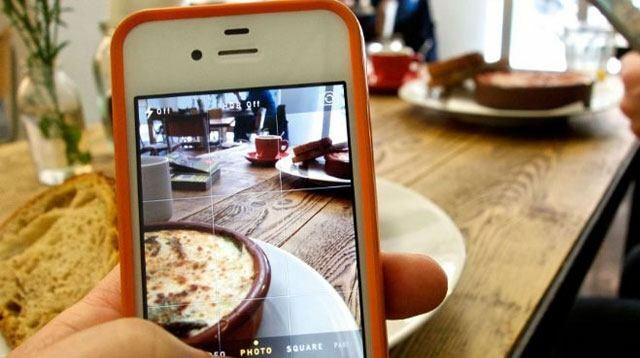 The study specifically looks at how this process affects companies attempting to market food to customers via Instagram, concluding that over-exposure can have the "unexpected effect" of making eating the food way less enjoyable. Basically, if we spend loads of time concentrating on taking the best pic of our food using the best filter and the best angle, we may find the actual eating element comes secondary in terms of importance and enjoyment.